This story was submitted by Michael Sims, Post Advisor for the Cherokee County Fire Explorer Post. 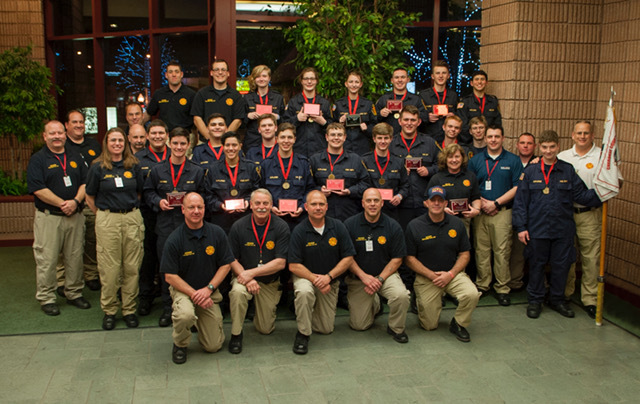 Cherokee County Fire & Emergency Services’ Explorer Post 469 brought home twelve awards during the 43rd Annual Winterfest Competition that was held in Gatlinburg, Tennessee. The competition took place February 11 at The Gatlinburg Convention Center with over 3,200 Explorers and Venturers from 17 states in attendance. Winterfest is the largest gathering of Venturers and Explorers in the United States. It allows participants to participate in a variety of competitive and social activities throughout the weekend. This was the 16th year that Cherokee County Fire Department’s Explorers attended the event. Post 469 brought 18 youth and 15 advisers to this event. Also in attendance from the department were Cherokee County Fire Chief, Tim Prather, Assistant Fire Chief, Eddie Robinson, and Operations Chief, Greg Erdely. Many friends and family members of Post 469 also attended the event. The local post made history this weekend by earning 12 top 3 finishes! They placed first in basic first aid, the Cherokee drill, the EMS combat challenge, high rise deployment, rapid rescue and resuscitate, and the Z-drag. The second place award was obtained in the hazardous materials operations station. Plus, the local Fire Explorers earned 3rd place in basic first aid, triple lay, high rise deployment, rapid rescue and resuscitate, and table top display. In addition to the competition, the Explorer Post Honor Guard presented the Nation’s and the State of Georgia’s colors at the opening ceremonies Friday night. This was the 12th time the post has had the honor of presenting the colors at Winterfest. The Explorers began training for this year’s Winterfest back in September 2016. They averaged 7-10 hours of training per week and were mentored by career and volunteer firefighters who volunteer as advisers and associate advisers. Cherokee County Fire Chief, Tim Prather, was very proud to the explorer’s accomplishments this year. “Being able to bring home 12 awards this year from Winterfest just shows you that we have one of the best Explorer programs in the southeast.” Chief Prather also wanted to thank Amicalola EMC of Jasper, Georgia, and Baker Imaging, LLC for donating $1,000 each to assist the young men and women with Explorer Post #469. This story was submitted by Michael Sims, Post Advisor for the Cherokee County Fire Explorer Post. For more information about Explorer Post 469 you can contact Sgt. Michael Sims at 678-644-1377 or mrsims@cherokeega.com.